05. Pre-Charge to Bulk Charge Battery Transition Voltage: 1 cell: 2.86Vdc to 3.15Vdc, 2 cell: 5.72Vdc to 6.30Vdc; 3 cell: 8.58Vdc to 9.45Vdc Charger will be in pre-charge mode when the battery voltage is below the transition voltage. 07. Back-Up Charge Termination Timer: 3 hours standard. Timer may be set to 3 to 12 hours range for batteries with high Ahr capacity by GT engineering. Charger will terminate charging when timer expired. Please advise Sales dept of you battery Ahr capacity. 03. 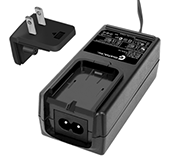 Over Temperature Protection: Charger will terminate charging if battery temperature reached 45°C±3°C. Charger will autorecover when temperature drops to about 30°C±3°C. For this feature, 10Kohm thermistor (NTC, 103AT) is required to be installed inside the battery pack. For battery packs without the thermistor, over temperature protection feature is not available and a 10K Ohm resistor is installed inside the charger to bypass the over temperature protection circuit. 05. Defective Battery Protection: If battery voltage will not rise above the pre-charge to bulk charge transition voltage (2.86Vdc to 3.15Vdc) within 30 minutes from the time pre-charging begins, the battery is considered defective and the charger will terminate charging. *When fault condition occurs, the battery has to be removed from the charger and reinstalled after at least 3 seconds to reset the protection. Charging will commence after battery reinstallation only when the fault is cleared. 1. IEC 60950-1, IEC 60601-1, IEC 60335-1, IEC 61558-1.